The original compact crossover, the Toyota RAV4 has for two decades taken its owners on countless urban, suburban and off-the-beaten-path adventures. For 2018, Toyota takes RAV4 even further with a new Adventure grade, adding unique rugged styling, higher ride height and other special features. In addition, RAV4 Hybrid now comes available on the LE grade, offering the same incredible EPA-estimated 34 mpg city and electronic on-demand All-Wheel-Drive system with intelligence (AWD-i). Significantly, all 2018 RAV4 grades are equipped as standard with Toyota Safety Sense P (TSS-P), which combines the Pre-Collision System with Pedestrian Detection (PCS w/ PD), Lane Departure Alert with Steering Assist (LDA w/ SA), Automatic High Beams (AHB), and Dynamic Radar Cruise Control (DRCC). TSS-P’s comprehensive features create in-the-moment safety designed to support a driver’s awareness and decision-making on the road. Complementing TSS-P are standard Hill-Start Assist Control (HAC) and rear backup camera, as well as available Blind Spot Monitor (BSM) with Rear Cross Traffic Alert (RCTA). Both BSM and RCTA are available on XLE, Adventure, and SE grades and come standard on Limited, Platinum, and SE Hybrid grades. With the addition of the Adventure grade, RAV4 now comes in six grades: LE, XLE, Adventure, SE, Limited, and Platinum. RAV4 Hybrid is now available in four grades for the 2018 model year: LE, XLE, SE, and Limited. In terms of standard features, RAV4 LE hybrid grade builds on the LE gas grade but adds standard features such as roof rails, Smart Key System, dual-zone automatic climate control, 17-inch alloy wheels, and more. The Adventure grade combines the feature content of the XLE with the sporty exterior accents of the SE and then adds unique features that outdoor enthusiasts will be sure to appreciate. Larger over-fender flares and 18-inch five-spoke black alloy wheels with big 235/55R18 tires give the RAV4 a kinship with tough Toyota off-road trucks. Raised ground clearance on the Adventure grade (now 6.5 inches vs. 6.1 inches) adds off-pavement and all-weather function. The Adventure identity continues inside, with such unique and exclusive features as carbon-fiber-like trim panels, leather-wrapped shift knob, “RAV4 Adventure” logoed door sill protectors, and all-weather floor and cargo mats with “RAV4 Adventure” badging. A 120V/100W power outlet in the cargo area is convenient for operating a portable air compressor or other equipment. Available in front-wheel drive (FWD) with an Automatic Limited Slip Differential, or in Dynamic Torque Control All-Wheel-Drive (AWD), the RAV4 Adventure grade lives up to its name. Both versions feature a standard Tow Prep Package that includes an upgraded radiator and supplemental engine oil and transmission fluid coolers, allowing the Adventure grade to tow up to 3,500 lbs. (AWD). Exclusive to the RAV4 Adventure grade, an available Cold Weather Package equips the vehicle with heated fabric front row seats with power driver’s seat, heated leather steering wheel, and wiper de-icer. Unique gray lower valance panels and rocker panel guards, black headlight bezels, black fog lamp surround, roof rails, and exclusive badging complete the RAV4 Adventure. Also new for the 2018 model year, RAV4 XLE is now available with the power-adjustable, heated front row seats. Non-hybrid RAV4 grades are powered by a punchy yet efficient 176-horsepower dual-overhead cam 2.5-liter four-cylinder engine with dual VVT-i (Dual Variable Valve Timing with intelligence). It’s teamed with a standard six-speed automatic transmission, and this combination yields EPA fuel economy estimates of 23 mpg city/30 mpg highway/26 mpg combined (LE, XLE and Adventure); 23 mpg city/29 mpg highway/25 mpg combined (SE, Limited, and Platinum). Models equipped with Dynamic Torque Control All-Wheel Drive have estimates of 22 mpg city/28 mpg highway/25 mpg combined (LE, XLE, and Adventure); 22 mpg city/28 mpg highway/24 mpg combined (SE, Limited, and Platinum). Driver-selectable operating modes let the RAV4 driver set the mood on the road. 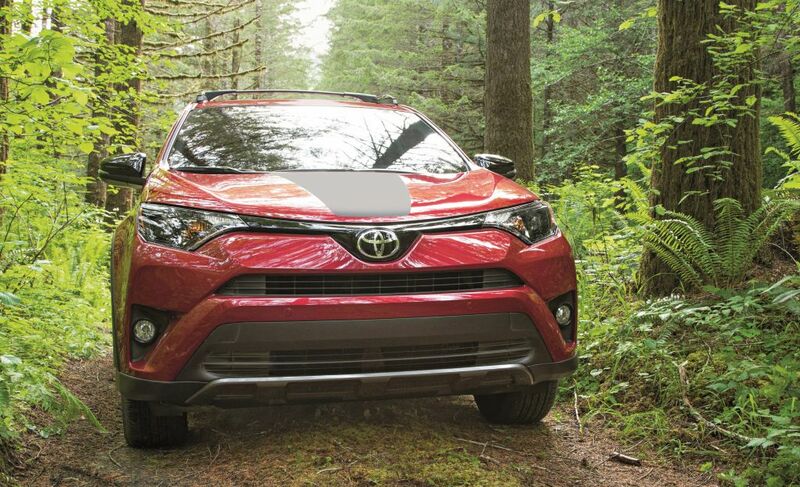 With Eco mode selected, RAV4 optimizes powertrain operation to help maximize fuel economy. Sport mode delivers sharpened shift timing, throttle response, and steering feel. Downshifting will “blip” the throttle, as the driver in a stick-shift vehicle might do. On RAV4 models with Dynamic Torque Control All-Wheel Drive, Sport mode also alters torque distribution to enhance agility. Choosing the RAV4 Hybrid brings both added power and higher fuel efficiency – a sweet deal. Hybrid grades come equipped with an Electronic On-Demand All-Wheel-Drive System with intelligence (AWD-i) as standard. A second, independent electric motor drives the rear wheels when needed to help maintain optimal traction. Toyota Hybrid Synergy Drive sets the benchmark for seamless hybrid performance, high efficiency, and exemplary dependability. Drivers love the way it works, because they cannot feel it working, and that’s the point. The 2018 RAV4 Hybrid combines output from a 2.5-liter Atkinson-cycle four-cylinder engine and a small high-torque electric motor through its unique transaxle. RAV4 Hybrid delivers powerful performance from a combined 194 system horsepower. The versatile Hybrid is the quickest in the RAV4 line, with zero to 60 mph in 8.1 seconds. The hybrid system varies power between the gas engine and electric motor, or combines both as needed, all seamlessly. Regenerative braking changes the electric motor to a generator that captures the kinetic energy of the still-turning wheels when the brake is applied, storing it in the nickel-metal hydride (NiMH) hybrid battery pack. Choosing ECO mode optimizes throttle response and air conditioning output to help prioritize fuel economy. In EV mode, RAV4 Hybrid, under certain conditions, will run solely on the electric motor for up to 0.6 miles at speeds below approximately 25 mph. A Hybrid System Indicator and fuel consumption indicator, located in a 4.2-inch TFT screen, helps coach the driver to operate the vehicle as economically as possible. The 2018 RAV4 Hybrid received an EPA-estimated 34 mpg city/30 mpg highway/32 mpg combined. The 2018 RAV4 offers a choice between two high-traction drive systems. With standard front-wheel-drive, the RAV4 gas model has a special traction enhancer called Automatic Limited Slip Differential (Auto LSD). Essentially, a second layer of computer logic in the Traction Control system, Auto LSD can be engaged at speeds below 25 mph to provide functionality similar to a mechanical limited-slip differential. Unlike Traction Control, it doesn’t cut into engine power, which helps give the driver control and distributes power where it’s most effective. On all RAV4 gas models, standard Hill-start Assist Control (HAC) helps prevent the vehicle from rolling backward when starting off on an incline when the brake pedal is released. All models (except SE and SE Hybrid) are equipped with standard Trailer Sway Control (TSC). A function of Vehicle Stability Control, Trailer Sway Control helps counteract handling forces that can cause trailer sway during towing by applying brakes to individual wheels. For maximum traction capability in all conditions, the RAV4 gas models offer the sophisticated Dynamic Torque Control AWD system. Taking input from various sensors (vehicle speed, steering speed and angle, throttle angle and yaw rate), Dynamic Torque Control continuously monitors and actively governs torque distribution to the rear wheels, as needed, via an electromagnetically controlled coupling positioned in the rear differential. Front to rear torque distribution can vary from 100:0 to 50:50, with front-wheel drive automatically engaged under normal driving conditions to help reduce fuel consumption. When accelerating, Dynamic Torque Control automatically shifts to AWD to help prevent front wheel slippage, or when sensors detect wheel slippage. Torque transfer to the rear wheels starts from the moment the steering wheel is turned to reduce the load on the front tires in all Drive Modes. If wheel slip occurs, the system transfers up to 50 percent of torque to the rear wheels to reduce front tire loading, thereby enhancing lateral grip. Pushing an AWD Lock button fixes torque distribution at 50:50 at speeds up to about 25 mph to help maximize grip for off-pavement driving or slippery conditions. Above that speed, the system reverts to Auto mode. A body structure that makes extensive use of high-strength steel provides a robust and stiff, yet light platform and is the foundation for the RAV4’s smooth ride, handling agility and cabin quietness. The MacPherson strut front suspension and double-wishbone style multi-link rear suspension allow the RAV4 to absorb bumps, ruts and railroad crossings with composure. The SE grades receive unique sport-tuned shock absorbers and coils for enhanced sport driving composure. Vehicle-speed-sensitive rack-and-pinion electric power steering provides precision feel and quick response. Limited and Platinum grades feature striking 18-inch 5-spoke Superchrome alloy wheels with P235/55R18 all-season tires. The RAV4 has certainly grown over its 22 years. One of the roomiest models in its segment, RAV4 remains eminently easy to maneuver and easy to park. There’s ample room for five adults, including competitive 37.2 inches of rear legroom and, behind the rear seat, 38.4 cu. ft. of cargo capacity (35.6 cu. ft. for Hybrid). With the 60/40 split rear seats folded, that space expands to 73.4 cu. ft. (70.6 cu. ft. for Hybrid). The rear seatbacks recline back up to 24 degrees for added passenger comfort, and rear privacy glass is standard on all RAV4 models. Special attention was directed towards improving cabin quietness. Sound insulation materials in the rear cargo area, floor pan, and side and rear doors help reduce road noise and create a premium feel. RAV4 SE is without a doubt the athlete of the family, featuring sport-tuned suspension (gas only), 18-inch alloy wheels and, unique to the gas-powered model, paddle shifters for the six-speed automatic transmission. The sporty attitude carries on with LED headlights and taillights, and exclusive front bumper with honeycomb grill design. The SE’s distinct S-Code paint motif (gas models only) combines one of three available upper colors (Super White, Black, and Electric Storm Blue) over Silver Sky Metallic on the vehicle’s lower trim. The sporty, upscale theme continues inside with SofTex-covered seats featuring a power-adjustable driver’s seat and contrast stitching, and a choice of two interior colors: Black or Black and Cinnamon, along with a black headliner, black A&B-pillar covers, sport floor mats, door sill protectors, and Gunmetal Gray trim. The SE’s instrument panel features twin dials with red illumination and red pointers, along with a standard 4.2-inch color TFT multi-information display. In the SE Hybrid, a Hybrid Gauge Cluster complements the multi-information display. The compact crossover segment demands utility, but “utilitarian” is out of the question. Customers are increasingly seeking some of the same features as luxury models, and the RAV4 Platinum delivers. Distinguishable by its full body color exterior and unique badging, the Platinum offers the RAV4 line’s highest level of standard technology and luxury. The Platinum expands on the Limited’s menu of luxurious amenities that includes SofTex- trimmed seats, dash, and door panels; heated front seats; 8-way power-adjustable driver’s seat; Smart Key System with push-button start; remote power liftgate; and a frameless auto-dimming rearview mirror with HomeLink. Platinum-specific standard amenities include a heated steering wheel, foot well ambient lighting, plush floor mats, and “Platinum”-badged door sill protectors. A boatload of high-tech includes the standard Entune Premium JBL Audio with Integrated Navigation and App Suite, five-door Smart Key System, foot-activated hands-free power liftgate with jam protection, and Bird’s Eye View Camera with Perimeter Scan, Overhead 360 degree view in drive and reverse, and curb view. The standard Entune Premium JBL Audio with Integrated Navigation and App Suite system brings music to life with 576 watts (maximum) pumped through 11 JBL GreenEdge Technology speakers in seven locations, including a subwoofer. RAV4 offers four available Entune audio systems. The LE, XLE, and Adventure’s standard Entune Audio includes the Entune Multimedia Bundle comprised of a 6.1-inch touch-screen display, AM/FM CD player, MP3/WMA playback capability, 6 speakers, auxiliary audio jack, USB 2.0 port with iPod connectivity and control, advanced voice recognition, hands-free phone capability, phone book access, and music streaming via Bluetooth wireless technology with integrated backup camera display with projected path static lines. The Entune Audio Plus with Connected Navigation comes standard on SE grade and available on LE, XLE and Adventure grades. It adds high-resolution and the Customizable Home Screen feature to the 6.1-inch touch-screen display and also includes HD Radio with iTunes tagging, SiriusXM satellite radio (with 3-month complimentary All Access Trial) and Traffic/Weather (metro areas only). The Connected Navigation via Scout GPS Link app is standard with this upgraded system and includes cell-phone driven navigation, voice activated search, traffic-based commute information, and more. In RAV4 Limited (and optional for the XLE and Adventure grades), Entune Premium Audio adds a 7.0-inch high-resolution touchscreen with Customizable Home Screen, Integrated Navigation and the subscription-free Entune App Suite. Entune Premium Audio adds AM/FM Cache Radio and pairs with the user’s smartphone to provide a richer in-vehicle experience with fully integrated access to navigation, music, and information services. Mobile apps include Destination Search, iHeartRadio, MovieTickets.com, OpenTable, Yelp, Facebook Places, Slacker Radio, and Pandora, plus real-time traffic, weather, fuel prices, sports and stocks. Customers can download available Entune updates right to the system. Entune Premium JBL Audio with Integrated Navigation and App Suite is available on SE and Limited grades; it’s standard with the Platinum grade. The 2018 RAV4 is equipped with the Star Safety System that includes: Traction Control (TRAC), Electronic Brake-force Distribution (EBD), Enhanced Vehicle Stability Control (VSC), Brake Assist (BA), Anti-lock Braking System (ABS) and Smart Stop Technology (SST). Eight standard airbags include dual stage advanced driver and front passenger airbags; front seat-mounted side airbags; first and second row side curtain airbags; driver’s knee airbag and a front passenger seat cushion airbag. Whiplash Injury Lessening (WIL) front seats are designed to help support the driver’s and front passenger’s heads during certain types of rear-end collisions. Toyota’s 36-month/36,000 mile basic new-vehicle warranty applies to all components other than normal wear and maintenance items. Additional 60-month warranties cover the powertrain for 60,000 miles and against corrosion with no mileage limitation. The hybrid-related components, including the HV battery, battery control module, hybrid control module and inverter with converter, are covered for eight years/100,000 miles. In applicable states, hybrid-related component coverage is 15 years/150,000 miles with the exception of the hybrid battery, which is covered for 10 years/150,000 miles. The 2018 RAV4 also comes standard with ToyotaCare, a complimentary plan covering normal factory-scheduled maintenance and 24-hour roadside assistance for two years or 25,000 miles, whichever comes first.